Below is information on the projects, feel free to email or phone me if you have any questions or need further directions for finding the works on the island. Attached are the location details and a map. I recommend for the Friday night sound performance at Gallery Augusta catching the 6pm Suomenlinna ferry from Market Square. 3-5 February 2012, Suomenlinna, Helsinki. Location 1- Rantavarustus (the shore work), Kustaanmiekka, Suomenlinna. Outdoor installation viewing during daylight hours, 3-5 February 2012. Location 2 - Gallery Augusta, Suomenlinna. Installation viewing 1-4 pm, 3-5 February. Sound performance Friday 3 February 6.30 pm. 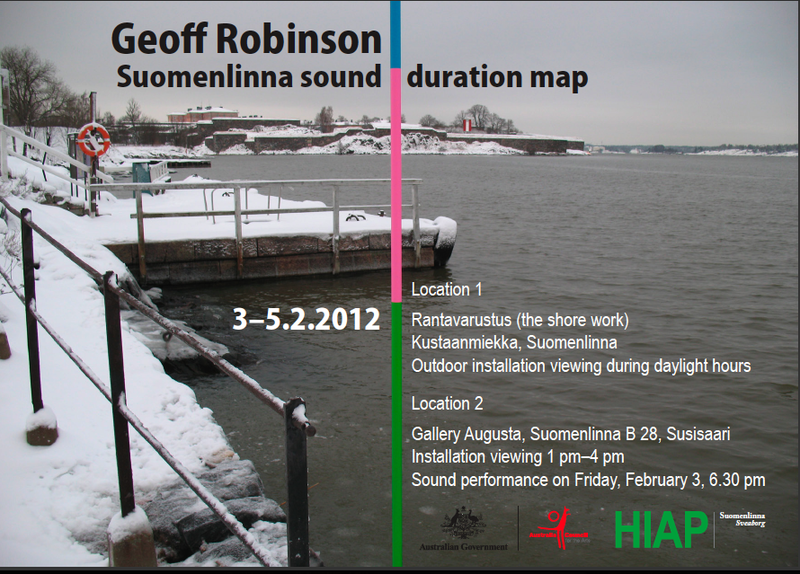 HIAP Suomenlinna artist-in-residence, Geoff Robinson (b. 1973) from Australia, will present two mapping installation works on Suomenlinna based on sound and sunlight documentation on the island. Robinson has documented the movement of the sun at Rantavarustus (the shore work) between November 2011 and February 2012. The movement of the sunlight, cast through a fortress window on to the landscape, will be marked and a spatial diagram will be constructed on site. During the residency Robinson has collected sounds on the island, at Gallery Augusta he will create a mapped diagram of the sound recording locations and perform the recorded sounds on Friday 3 February 6.30 pm.